Community Description: Krummholz refers to the zone between treeline and more open alpine vegetation, where tree species are limited by the harsh conditions to a dense shrub growth-form. 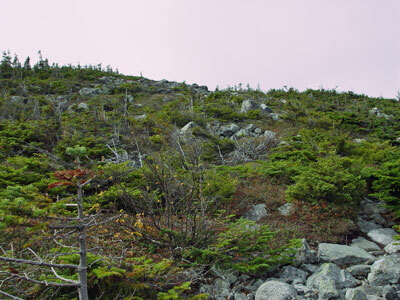 Black spruce, balsam fir, and heart-leaved paper birch form masses of stunted and wind swept shrubs 0.5-2 m high. Mountain alder may be locally common, and mountain ash and mountain shadbush are occasional. Total shrub cover is often close to 100%, and these areas may be all but impenetrable. 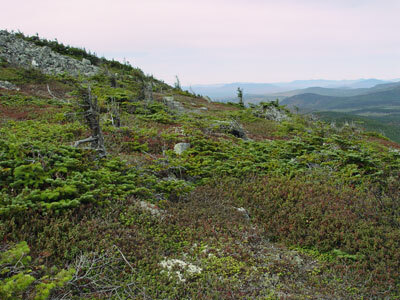 Boreal herbs, such as bluebead lily and Canada mayflower, grow with patches of mosses in small openings among the shrubs, but total herb cover is sparse. Bryoids may be extensive beneath the shrubs. Back to top. Soil and Site Characteristics: This type occupies upper mountain slopes above treeline, typically at elevations of 2700 - 3700’. The cool conditions, lingering snows, and frequent fog and clouds create a fairly moist microclimate, but the sites are very exposed to wind and storms. Back to top. 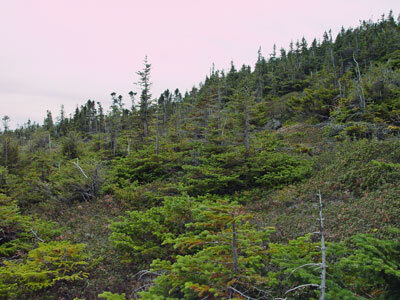 Diagnostics: These are forests of the treeline zone in which dwarfed and matted trees form a dense shrub layer 0.5-2 m high; usually strongly coniferous. Back to top. Similar Types: Subalpine Heath - Krummholz can grade into or form a patchwork with this community, but it features lower tree cover (<25%) and more heath shrubs and open spaces. Subalpine Fir Forests share many overstory species and can grade into this community but is distinguished by having more upright trees and a fairly well developed herbaceous layer. Back to top. Conservation, Wildlife and Management Considerations: Krummholz is extensive on Maine's higher mountains, and most major occurrences are well protected within public lands or private conservation lands. The historic extent has been somewhat reduced by the development of ski areas, and proposals for wind generators could impact other minor sites. Because traversing this vegetation is so miserable, off-trail impacts from hikers are minimal, in contrast to other alpine/subalpine vegetation types. This high-elevation dwarfed forest community type provides habitat for Bicknell's thrush, which only inhabits structurally complex forests above 2500'. Coniferous forest specialists like blackpoll warblers and spruce grouse are common associates in this community. Back to top. Distribution: Upper-elevation ridges of Maine's western and central mountains (mostly in the New England - Adirondack Province), extending westward and southward along the Appalachians , and likely to the Gaspé peninsula. Landscape Pattern: Large Patch. Back to top. Baldpate Mountain, Grafton Notch State Park Oxford Co.
Bigelow Preserve Public Lands Somerset Co. Goose Eye Mountain, Mahoosuc Public Lands Oxford Co.